Madalyn Colgrove on Sweet Baby Marie. Hart Photography. 2018 Lucas Oil NCHA Super Stakes � April 3, 2018 � Fort Worth, Tex. Madalyn Colgrove, Boligee, Ala., took control of the Super Stakes Classic Non-Pro first go-round in Tuesday�s first set with a 221-point score on Sweet Baby Marie that was never threatened. Colgrove, who also earned 215 points on Tuesday with WRS Dunnit With Jose, leads the 78-rider field that qualified for Wednesday�s second go-round with scores of 210 or higher. Colgrove, who placed seventh in the NCHA Non-Pro World standings and is the earner of $552,503, showed Sweet Baby Marie as reserve champion of the 2017 NCHA Derby Non-Pro, as well as of the 2017 Breeders Invitational 4-Year-Old Non-Pro. The talented pair also won the 2017 Cotton Stakes Non-Pro championship and the 2018 Cattlemen’s Derby 5/6 Non-Pro. Five-year-old Sweet Baby Marie, by High Brow CD, was bred by Grace Ranch out of Hangem High Pep, dam of Time To Hangem LTE $247,374, by One Time Pepto. Sweet Baby Marie is the earner of $147,049. Kathleen Moore, Madill, Okla., and her palomino mare The Golden Shot, claimed 217.5 points, Tuesday�s second-highest score. Moore was a finalist (12th) in the 2017 NCHA Futurity Non-Pro on Princess Betty Rey and placed fifth in the 2018 Abilene Spectacular 5/6 Classic Non-Pro with Docs Crooked Cat. 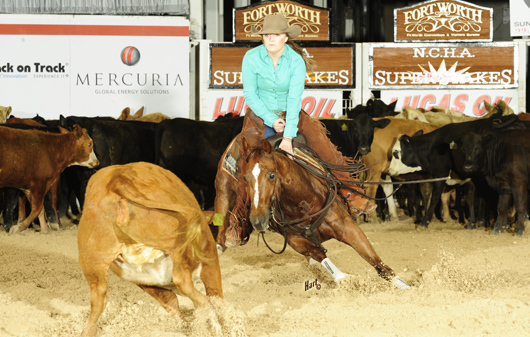 Moore, the NCHA earner of $480,881, also won the 2010 NCHA Derby Amateur on Sarendual. Five-year-old The Golden Shot LTE $27,042, by WR This Cats Smart, made her debut as a 2016 NCHA Futurity Open Semi-Finalist with James Payne, and Moore showed the mare as a finalist (15th) in the 2017 NCHA Derby Non-Pro. Chelsea Tatum, Overbrook, Okla., and Cameron Thompson, Poolville, Tex., tied with 217 points, Tuesday�s third highest-score. Tatum was showing 5-year-old Bobs Smart Rey, the Dual Rey daughter who carried her to place fourth in the 2016 NCHA Futurity Non-Pro, and for the championship of the 2017 Pacific Coast Futurity 4-Year-Old Non-Pro. Most recently, Tatum and Bobs Smart Rey claimed the 2018 Abilene Spectacular 5/6 Classic Non-Pro reserve title and won the Non-Pro Limited division of the same event. Bobs Smart Rey is out of Bobs Smart Chance LTE $219,581, who carried Glade Knight as reserve champion of the 1999 NCHA Super Stakes Amateur division and Nelson Knight as reserve champion of the 2001 NCHA Super Stakes 5/6 Classic Amateur. Cameron Thompson, the NCHA earner of $169,892, rode 6-year-old This Isa Third, who he showed to win the 2017 Cotton Stakes 5/6 Amateur Unlimited. This Isa Third won the 2015 NCHA Futurity Limited Open and placed third in the NCHA Futurity under Kody Porterfield. The gelding, sired by Third Cutting, is the NCHA earner of $141,658. Thompson won the 2012 NCHA Eastern Nationals Senior Youth championship on Tracker Jones, and was reserve champion of the 2014 NCHA Classic Challenge aboard Hard Eight BBQ, who he also showed as reserve champion of the Southern Futurity Classic Amateur.